The Br’sqvur ships were very different from the ships people normally see in science function. First off, they weren’t solid, at least for the colony ships. Instead, they consisted of a multi-layered geodesic sphere, constructed out of large tubes through which the Br’sqvur could swim. At each external junction were multiple engines. The computer system controlled all of these engines allowing the sphere to move in pretty much any direction. Towards the interior of the ship, junctions consisted of large pools surrounded by hollow shells. Families resided in these shells, as the Br’sqvur were still air breathing and to an extent land dwelling. At the center of the ship was a large power core, surrounded by the computer core and other essential systems. This area was also the “bridge,” though not much of one was needed, as each member of the colony was able to interact with the ship through their direct neural interface. 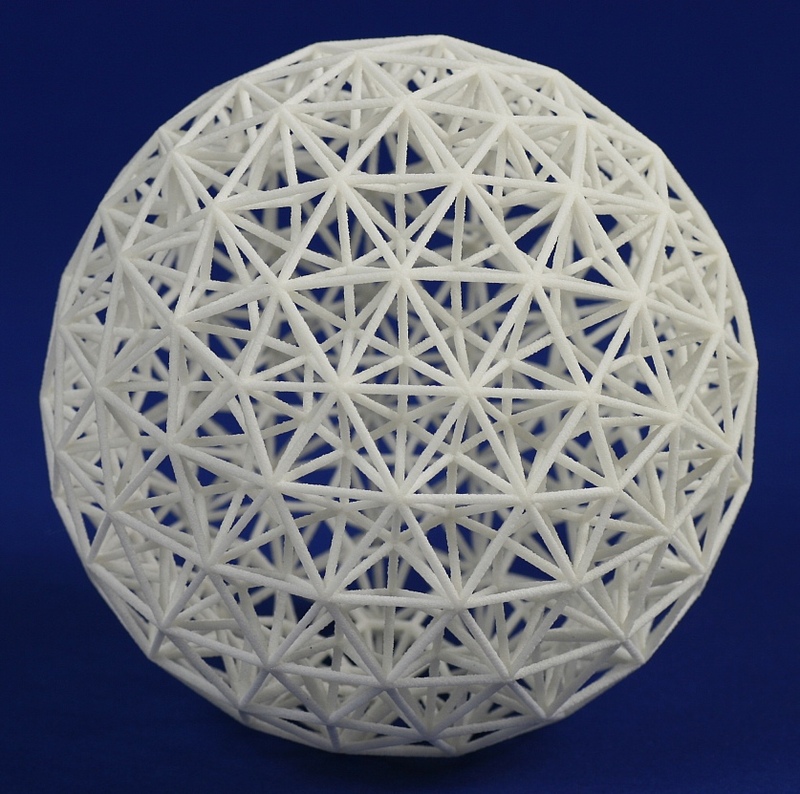 For those who are not familiar with geodesics, below is a two layer geodesic sphere, designed by George W. Hart. The colony ships, depending on their size, likely consisted of far more than two layers. Also, because of the aquatic nature of much of the ship, there really wasn’t any need for all that much life support. The hull itself was heavily insulated for the most part, so it took minimal energy to heat the environment, and most of the energy for environmental regulation went to artificial light. An artificial biome throughout the ship, produced a large amount of plankton, which fed smaller organisms, and eventually larger ones, allowing for a food source for the Br’sqvur; their ships were essentially miniature words.